Following on from last year just say where you were and add the number of nights to the running total. We hope Ian doesn't mind us adding a warning. For your own security, don't post anything prior to going away as there are ne're-do-wells out there who may be able to take advantage of this information but please feel free to add information after the event. Another 31 to add please. Second part of Camping Club rally at Camping La Manga. Our total for 2019 - 31. Auto spell doing the wrong thing. "Sent to Coventry" for 7 nights while attending the NEC each day. Another 57 to add please. The longest time the van has ever been in one place. C&CC rally at Marjal, Costa Blanca. New total - 114 including Gordon’s. Our total for 2019 - 88. 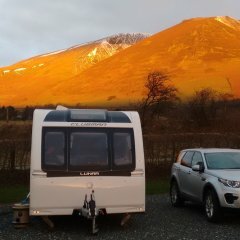 Interests:Caravan (obviously), family, relaxing, and am an avid petrol head!! Our total for 2019 - 91. Our total for 2019 - 95. Carefree Nurseries CL near Fareham. Only 12 miles from Portsmouth. Our total for 2019 - 96. Our total for 2019 - 97. Newbold Grounds CL near Staverton. Our total for 2019 - 100. Midland centre rally near Tamworth. Our total for 2019 - 102. Chatsworth Park CMC site at Bakewell. Our total for 2019 - 104.